Conlon & Dunn | Commit Marketing | A Full-Service Marketing, Web Design & Development Firm Located In Sarasota, FL. 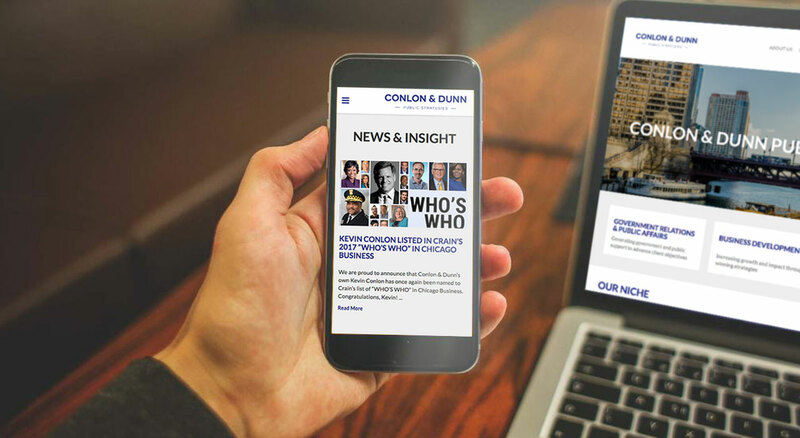 Conlon & Dunn Public Strategies – Based in downtown Chicago, and in its third decade as a trusted advisor to businesses, non-profits, civic groups, political campaigns and coalitions, Conlon & Dunn helps clients build complex partnerships, develop their programs and strategies, use new engagement tools, and launch highly effective government relations initiatives. Reinforcing a 30 year foundation. The goal was to deliver a refined and modern approach to their branding and online presence. The team at Commit was presented the task to present logo and branding recommendations. After a few rounds of revisions we defined the new logo and branding. With their brand in place we designed and developed a new website fit to their needs and market.